← Henri, le chat noir, shares his thoughts on Halloween. Guy shares power strip with strangers. The guy was spreading false rumors during Sandy, causing ConEd and the NYSE, among others, to take a break from doing important stuff to quelling the rumors was a Republican consultant. The Mittster on disaster recovery: it’s like cleaning up the debris from the football field. Big storm requires big government. * Here’s a little help. This entry was posted in Links, Rants, various. Bookmark the permalink. 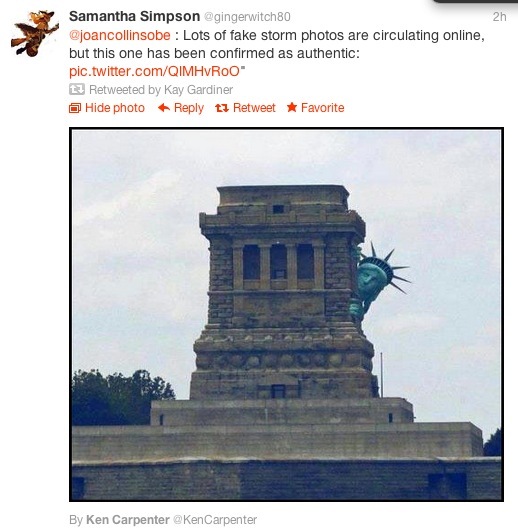 0 Responses to More stuff about Sandy. 🙂 You’re like the social media reporter for Sandy. Thanks for the photo link! I’d found the snopes page, but it only listed the fakes… some of those real ones are, well, horrible and fascinating. My favorite, though, is the one with Godzilla coming out of the sea.